Greetings Tech Fans! 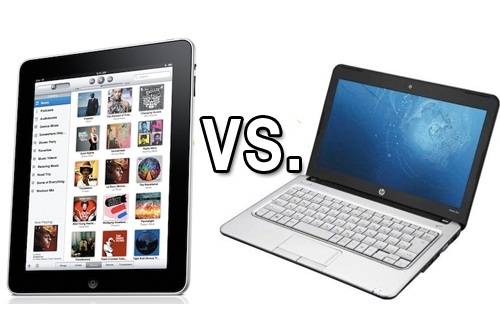 Sorry to disappoint, but no, I'm not writing today about some silly new iteration of MTV's Celebrity Deathmatch, even though who wouldn't wanna see a fight to the death between the iPad and the Macbook Air? No one? Yeah, I 'spose that makes sense. BUT when it comes time to pick out a new primary computing device, we're seeing more and more folks opt for some sort of Tablet device. Now while I've always held the position that Tablets are perfectly good devices for users who are simply content consumers, the second they try to use those same Tablets to create content, they find them lacking. Here's the gist - if ALL you do is browse webpages, read email, engage in the occasional video chat then a tablet's just the ticket. But on the other side of the coin, if one is actually writing a document or even a lengthy email, well then Tablet's are just perfect for that too! SAID NO ONE EVER. I'm not even going to get into the cost benefit argument because a halfway decent PC is easily $100+ cheaper than a iPad. Even a Macbook Air 11" (which actually does everything most folks think an iPad is capable of) is in the same sort of price range as a comparable iPad - and it, you know, actually is good for doing stuff. So with that said, will this always be that case? For the foreseeable future, yes. Until they come up with some magic way of getting the ideas out of your head and into your portable tablet, smartphone, smartwatch, smartglasses, or whatever other smart thing you're carrying around in a methodology equally as good or better as you can do it on an actual computer, you're better off with an actual computer. Sorry to any of my English or Comp teachers for that ridiculously long run-on sentence. Now as a secondary device, a tablet may be just the gadget you need for lightweight access to the content you crave on the go. Ever since I scored a Galaxy Note, I've had no further need for a tablet, and the writing's on the wall that most consumers won't either. As much as the manufacturers of these things want you to buy all of them, it's really up to you if they're worth it. You need to decide what works best for your workflow, but today, most end users are still lost without a computer by their side. Or in my case, a dozen or so.